The IKAA has a two day meeting in Amsterdam. This is a great opportunity to celebrate the existence of the Adoptee community worldwide. To make this meeting complete we are organizing an event to never forget. The exact program will be announced later, but we can tell you at this moment that you don’t want to miss it! Besides that Amsterdam is cool, hip and trendy we found the perfect spot to have all the freedom and creative possibilities that can host our event. Off course Korean food, workshops and entertainment all packed in a 2 day event. Sign up before it is full! We only will accept 150 attendees (this includes children). The application deadline is 30 September 2014, after this date there will be an additional fee of 10 Euro (if it is not already fully booked)! The entertainment program will be a talent test lab. Do you have ANYTHING to share with us, like a song, a dance, a performance, a poem, a pole dance (bring your own pole), magicians tricks or just a word to share… sign up at kaf@arierang.nl. Off course the winner will be rewarded BIG! We are still discussing, but probably it will be a return ticket AMS – SEOUL!! So be creative and sign up fast! For attendees that needs a Hotel for this weekend, we have made 2 dozens of reservations at Hotel Boutique. Please mail us (or leave a comment, see below) if you want to have more information about the rates and conditions. Our program will have a movie on Thursday night. The official program will start on Friday. So if you are planning to join the whole weekend make sure you register on Friday morning from 09:30 to 10:30. Saturday the registration desk is also open from 09:00 to 12:00. 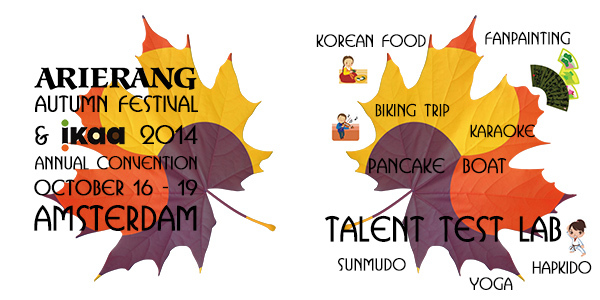 Hope to see you at our Korean Autumn Festival!